EasyTurf synthetic turf is made from a soft and silky fiber surface that can take a beating from active kids and energetic pets. Completely safe for playgrounds, this synthetic surface requires no chemicals, doesn’t attract common yard pests and is hypoallergenic. As homeowners, we know how bad our lawn can look while owning pets. 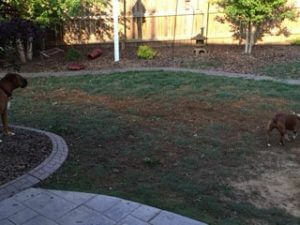 Ugly stains and grass damage can seem inevitable, but with synthetic turf, those days are gone. 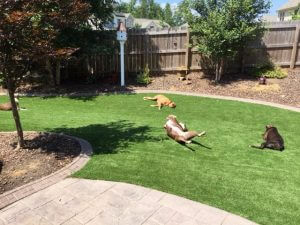 EasyTurf residential synthetic turf is a wonderful fake grass for dogs and pets. It does not discolor or stain and it’s made of non-toxic material, so you can rest assured that your pet is safe. What’s better? With special drainage technology, grass cleanup is simple! 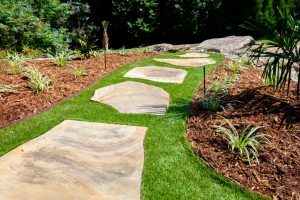 At Hicks Landscaping, we take pride in helping you achieve the yard of your dreams. 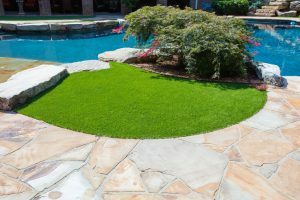 If you’re looking for a solution to enhance the durability and appearance of your lawn, consider taking advantage of EasyTurf residential synthetic turf. Contact us today to get started!